Wells came to be in Sandgate, and to commission Voysey, as a result of a combination of illness and literary friendship. In 1896 Wells had befriended the ailing novelist George Gissing, and, when Wells’s own chronic kidney condition led to his collapse during a cycling holiday along the south coast in 1898, it was Gissing’s childhood friend, Dr Henry Hick, who became Wells’s personal physician. Hick was living in the village of New Romney, and was medical officer for health for Romney Marsh, the hauntingly beautiful wetland that lies in the south of Kent and stretches into East Sussex. Wells recuperated in Hick’s home for a month before moving to a small house on the beach in nearby Sandgate. He liked Sandgate so much that he resolved to stay, but could not find a house of the right size and aspect. So he decided to commission one, and it was Mrs Hick’s brother-in-law, Voysey – later described by Wells as “that pioneer in the escape from the small snobbish villa residence to the bright and comfortable pseudo-cottage” – whom he appointed. This chain of events shows how things happen for contingent and often trivial reasons, even to major writers. 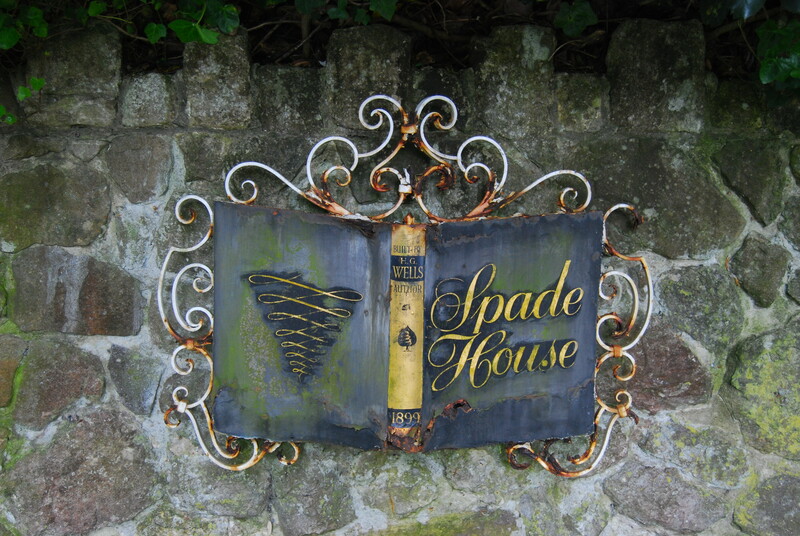 What Spade House represents in the life and the work of H.G. Wells is more than a biographical footnote, however. For one thing, Wells’s move to this part of Kent was a significant development in the creation of the Edwardian period’s most significant literary network – the Romney Marsh group, who are rarely labelled in this way and yet collectively had as great an influence on twentieth century literature as the so-called Bloomsbury Group that followed them. Henry James, Joseph Conrad, Ford Madox Hueffer (later Ford), Stephen Crane, and Edith Nesbit all lived, like Wells, in or around the Marsh. They visited each other, hosted visiting luminaries – Gissing stayed at Spade House for two months during an emotionally and physically fraught period in 1901 – and there is a palpable sense of arrival in Conrad’s letter to Wells in October 1898 in which he announces that he is taking over a farmhouse near Hythe from Hueffer, its previous occupant. Although these literary giants appeared to fall out with each other for various complex reasons around 1908, for the decade or so before then they constituted an identifiable literary network, collaborating, consulting, and competing in the art of fiction. The area appears so frequently in Wells’s fictions of the period that it almost becomes a character, from the day out at Lympne in Kipps (1905) to the dramatic ascent of Bert Smallways in a hot-air balloon from Dymchurch beach in The War in the Air (1908). Sandgate itself is the setting for The Sea Lady (1902). Moreover, Spade House has an important place in Wells’s work as well as his life. As Simon J. James notes in his recent monograph on Wells’s aesthetics, Spade House was his first utopian project, and, as a collaboration with Voysey, it is a testament to the intellectual and aesthetic ambitions of both men. Voysey was not a prolific architect and, unlike his contemporaries, such as Charles Rennie Mackintosh or Edwin Lutyens, did not design large-scale public buildings. His fifty or so buildings are mostly domestic, and he brought to architecture on this scale an individual sensibility that combined an Arts and Crafts aesthetic, a fondness for grotesque and gothic features (he admired Pugin above all others), and, paradoxically, a distinctively simple style, proto-modernist to our eyes, and an approach that was utilitarian in the best sense. The houses of Voysey’s mature period were beautiful and attentive to tradition – using artisan techniques and materials such as roughcast – but also intelligently planned. Voysey should have been Wells’s perfect architect, and yet there is evidence the two did not see eye-to-eye on matters of design. Their differences were expressed most starkly in a dispute over Voysey’s signature motif – a heart – which he wanted to use for example in the design of the house’s letterbox. Wells would have none of this, and insisted that the heart be inverted to form a playing-card spade, giving rise to the house’s name and a local legend that the Wells who had commissioned this large villa was not the science-fiction writer but the gambler Charles Wells, immortalized in the popular song, ‘The Man Who Broke the Bank at Monte Carlo’. Wells got his way on this point and his views on efficiency, his fears for his own health, and another new project – starting a family – also left their marks on the fabric of the building. He stipulated low positions for door handles where they could be reached by a wheelchair user or child; a new storey for the childrens’ rooms was added in 1903. (The location selected by Wells was also conveniently adjacent to the Sandgate Hill Lift – now sadly defunct, but in Wells’s day was a remarkable contraption using water-balancing to move a lift car up and down the hillside.) And the house’s most remarkably modern feature was en-suite bathrooms – a standard feature in modern house design, but an innovative one in an age when the toilet was often to be found at the end of the garden, and a house’s water supply and its beds were usually separated by several floors. This project connects in significant ways with both strands of Wells’s literary production in the period – his utopianism, and his realist fiction. One of Wells’s first actions after moving into Spade House was to write his first non-fictional utopian work, Anticipations (serialized 1901), which considers house building and design among its many topics. But it is in Kipps that the questions that he started to answer in commissioning Spade House receive their fullest consideration. In this reworking of Dickens’s Great Expectations, Kipps – who hails from New Romney where Wells recuperated in 1898 – receives a legacy that saves him from life as a draper’s assistant, and after adventures and misadventures in the genteel world of Folkestone’s high-society, settles down to married life with his childhood sweetheart Ann, a former servant. They resolve to use his inherited windfall to build a house, but Ann’s ideas of simplicity and efficiency – rooted in her personal knowledge of the contribution that poor design makes to the misery of domestic servitude – are repeatedly trumped by Kipps’s inability to refuse the suggestions of the conventionally minded architect. He insists on more rooms, more pointless features, and more incoherent decoration, until the planned house becomes “quite fungoid with External Features, and honeycombed with Internal ones”. Voysey believed that “[s]implicity in decoration is one of the most essential qualities without which no true richness is possible”, proving that in his philosophy of design and life he was a long way from Kipps’s architect. Moreover, Wells was no Kipps. As plans for Spade House developed, the design became more simple, not more fungoid: gables were eliminated, rounded bays become square, and a conservatory was removed from the plan. This modern utopia on a domestic scale not only fulfilled its first occupant’s needs, with the minimum of effort, but also anticipated the needs of its current occupants, who, one presumes, benefit today from its low door handles and en-suite bathrooms. H.G. Wells, Experiment in Autobiography. 2 vols. London: Faber and Faber, 1984, Vol. II, p. 638; Norman and Jeanne MacKenzie, The Life of H.G. Wells, the Time Traveller. London: The Hogarth Press, 1987, p. 149. Frederick Karl and Laurence Davies (eds. ), The Collected Letters of Joseph Conrad, Volume 2: 1898-1902. Cambridge: Cambridge University Press, 1986, pp. 100-101. Simon J. James, Maps of Utopia: H.G. Wells, Modernity, and the End of Culture. Oxford: Oxford University Press, pp. 135-36. See Duncan Simpson, C.F.A. Voysey: An Architect of Individuality. London: Lund Humphries Publishers Ltd., 1979. Kipps: The Story of a Simple Soul. London: J.M. Dent, 1993, p. 261. ‘The Aims and Conditions of the Modern Decorator’ (1895), quoted in Simpson, C.F.A. Voysey, p. 61. Simpson, C.F.A. Voysey, p. 81. This entry was posted in Essays and tagged edwardian architecture, H G Wells, Spade House, Voysey. Bookmark the permalink.